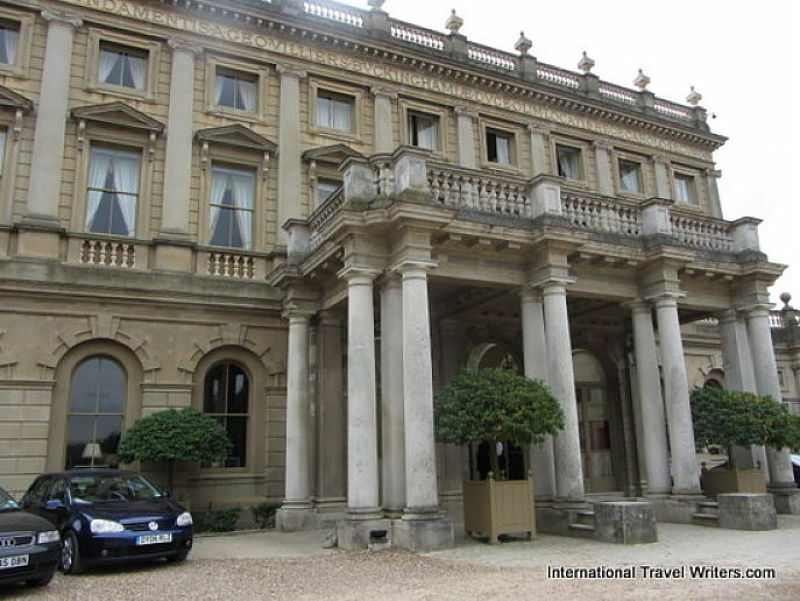 We were very fortunate that our friends Jim and Yvonne, arranged with her sister Sheila and her husband Tony who are Cliveden Club members, to take us for lunch at this exquisite location. 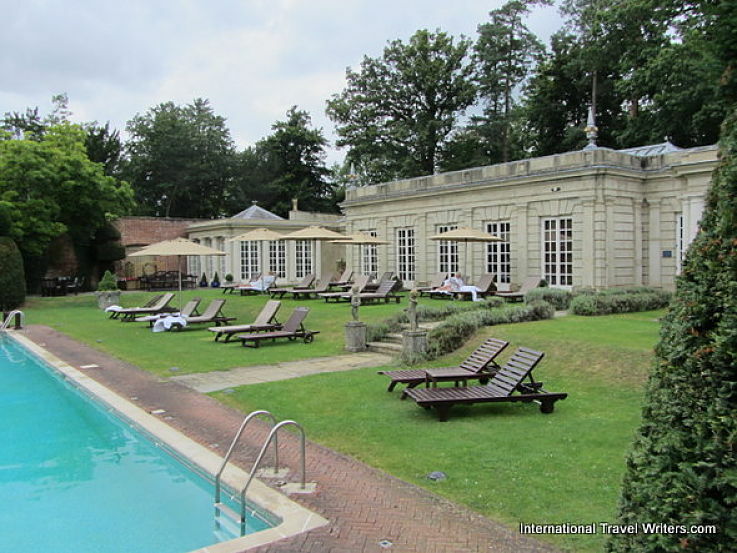 Otherwise, we may have never known about this regal retreat outside of London on the edge of the New Forest National Park...nor had an extensive tour by a knowledgeable host who provided an extensive background narrative. 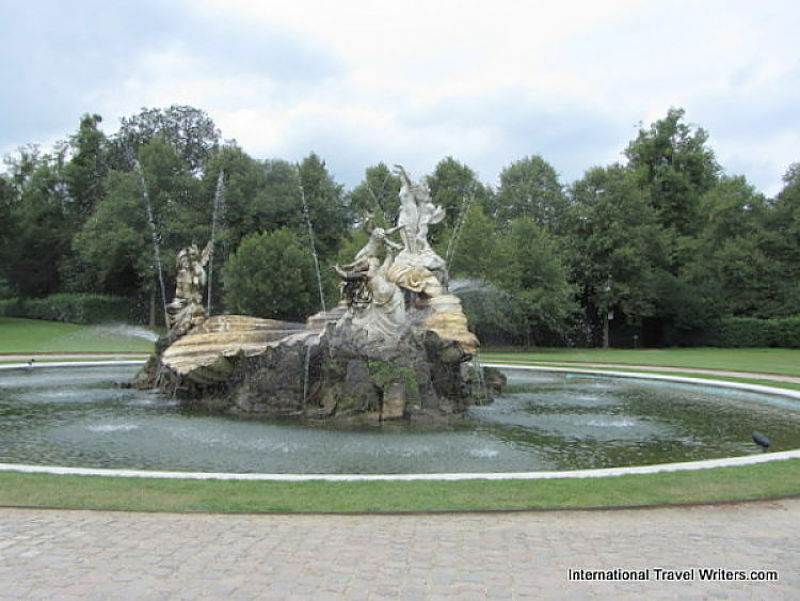 As we entered the property we were greeted with an imaginative work called "The Fountain of Love" sculpted by the American artist Thomas Waldo Story in Rome in 1897. It was commissioned by Lord Astor for this site. It is crafted of a huge Carrera marble shell with three full sized females and cupid. There is also a collection of well-heads and oil jars found throughout the gardens that originate from both Venice and Rome. As I allowed my wide-eyed gaze to continue up the lengthy driveway my anticipation heightened as I began to get an inkling of the extensiveness of this 376 acre estate, half of which are gardens, woodlands and lawns. This property immediately came to mind later when I watched the series "Downton Abbey". 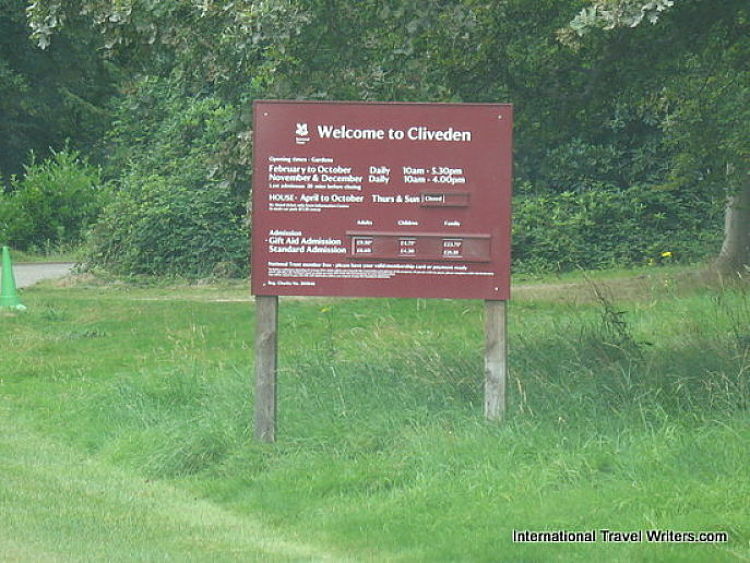 In 1237 A.D. the bare land was owned by Geoffrey de Clyveden, hence the name Cliveden is derived from a variation of the original land owner's name. View of Cliveden from the gardens. You can see the Clock Tower (which is actually a working Water Tower) on the left hand side. 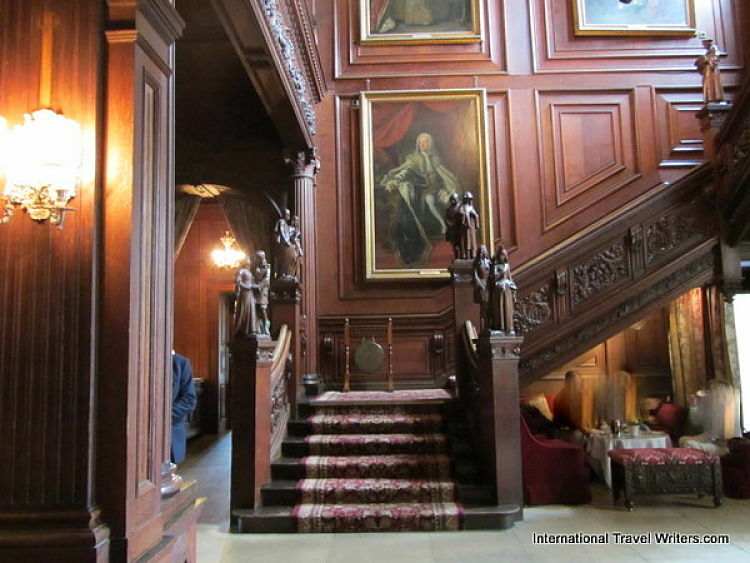 Navigating through the history of Cliveden is like an epic tale of notoriety and romantic affluence. According to the “fact sheet” I was given on a recent visit, (and will be quoting parts of throughout), the first house was built in 1666 by the 2nd Duke of Buckingham. He was known as a notorious rake, schemer and wit and actually created Cliveden as a hunting lodge where he could entertain not only his friends but also his mistress. The Duke ended up challenging his mistress’s husband to a duel and killing him in Jan of 1668. A cross-sword emblem set into Cliveden’s East Lawn commemorates this bloody encounter. His fall from social grace dampened his spirits and after the death of Charles II in 1685, he himself died in 1687 after a cold caught while fox-hunting. Although the building was twice destroyed by fire over a couple of centuries it has been expanded and restored to immaculate standards. 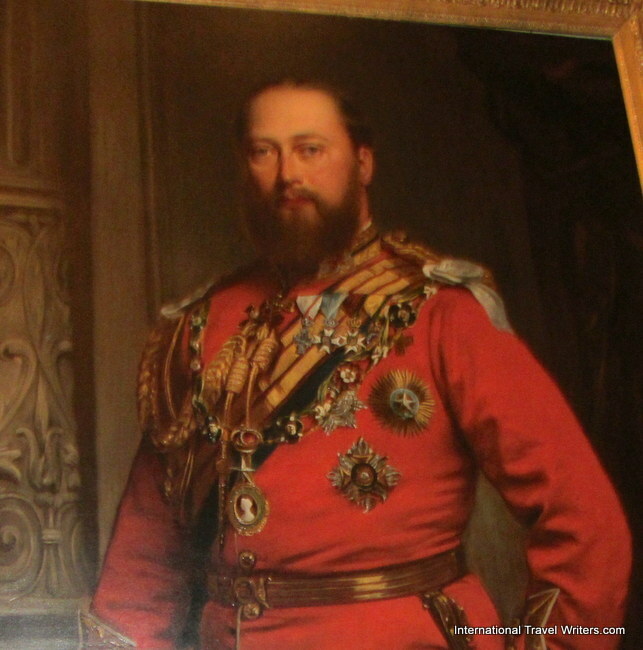 Queen Victoria was a frequent guest from nearby Windsor Castle (8 visits with a large entourage during her reign) and was extremely displeased when the house was bought by William Waldorf Astor in 1893 (at that time he was the wealthiest American citizen). However, he gave it to his son and daughter-in-law in 1906 and it catapulted upward on the social scale to become a hub of vibrant society circles…guests included luminaries of the day such as Chaplin, Churchill, Joe Kennedy, Gandhi, Amy Johnson, F.D. Roosevelt, T. E. Lawrence, Kipling, Henry James, Edith Wharton, George Bernard Shaw, etc. The staircase newel posts have ornamental carved figures representing former owners such as those listed below as well as the 2nd Duke of Buckingham, referenced above. The second owner of Cliveden, the 1st Earl of Orkney, was a rather dashing fellow who was made an Earl by Queen Anne. He was a famed soldier who had fought in several great battles against the French. Amazingly, without ever visiting America, he achieved the high political office of Governor of Virginia from 1710 to 1737. However, he and Lady Orkney, along with gardeners borrowed from Queen Anne, George 1 and George II expanded the estate by adding the East and West Wings, Blenheim Pavilion (1727) and Octagon Temple (1735). Plus, the magnificent gardens that exist today owe much of the planning to their vision. The earliest recorded royal visits to this splendid estate took place in 1724 (George 1) and 1729 (Queen Caroline). Frederick, the Prince of Wales, was the eldest son of George II but he died before becoming King. His son, George III had that honor. Frederick never actually owned Cliveden but leased it from Anne, 2nd Countess of Orkney, and it became the setting for many musical concerts featuring the work of Handel. In 1740 ‘Rule Britannia’ was first performed there and Handel borrowed it as the opening strain of his Occasional Oratorio in 1746. This magnificent estate entered a period of relative decline after the death of Frederick. Although its royal connections remained intact, the earldom of Orkney passed on through the female line for three successive generations and disastrously, during the tenure of the 4th Countess of Orkney, burned down in July, 1795. Only two wings of the house survived and the Countess continued to inhabit that space for another 20 years. In 1820, after the death of her son, the entire estate was auctioned and subsequently purchased by Sir George Warrendar in 1824. The undistinguished period of Cliveden was about to burst forth with a new vigor and stewardship. 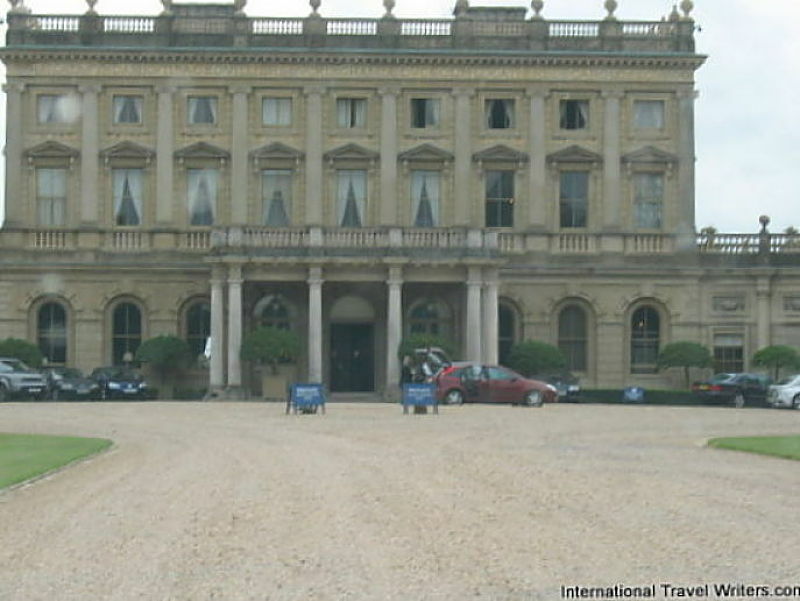 With Sir George Warrendar as the new owner and host, Cliveden soon regained the splendour of its earlier days and he established the tone of relaxed hospitality that it is known for today. Upon his passing in 1849 the estate was inherited by Sir George’s brother who immediately sold it to the Duke of Sutherland. Later in that same year it suffered its second catastrophic fire. At this point the “big guns” were brought in…Charles Barry, designer of Big Ben and the Houses of Parliament, taking inspiration from Somerset House in London did the main House. 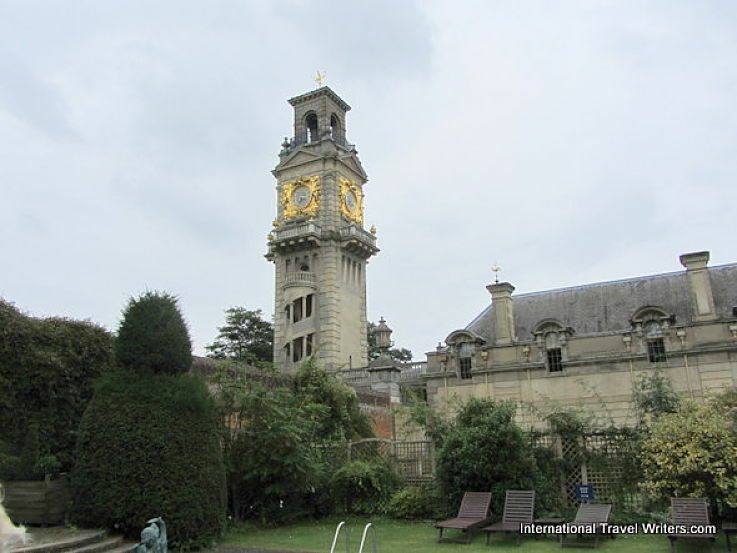 Henry Clutton was responsible for the 100-foot tall Water Tower which stands to the west of the House (disguised as a clock tower). John Flemming, a leading garden designer of the day laid out the bedding scheme and followed up over the next few years with planting flowers in the adjoining woods. Even today the hotel's insignia is that of the Sutherland family and consists of a coronet with interlaced "S"s and acanthus leaves. During this period Cliveden began a long association with progressive, Liberal politics mainly through the close association of the Duchess of Sutherland with Prime Minister William Gladstone. Upon the death of the Duchess of Sutherland in 1868, the estate was sold to the Duke of Westminster, who fell in love with the place after spending his honeymoon there. He went on to spend 25 happy years there and he sold the house in 1893 to Astor, returning to his main residence at Eaton. 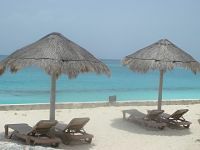 Seen above are the Spa and lounge chairs surrounding the pool (in 1990 the indoor swimming pool and spa treatment rooms were added). 1893-1966 -The Astors and the "Golden Age"
William Waldorf Astor’s legacy at Cliveden was more architectural than social. He was ill at ease in company so instead he devoted his energy to utilize his artistic talent on the grounds and the House. His most famous endeavor was to import every last facet of Louis XV's wood-paneled room from the Chateau d’Asnieres (that he inhabited with his mistress Madame de Pompadour) near Paris in 1897. This became known as the French Dining Room. The entire French Dining Room is adorned and embellished with the gilding as it arrived from France. 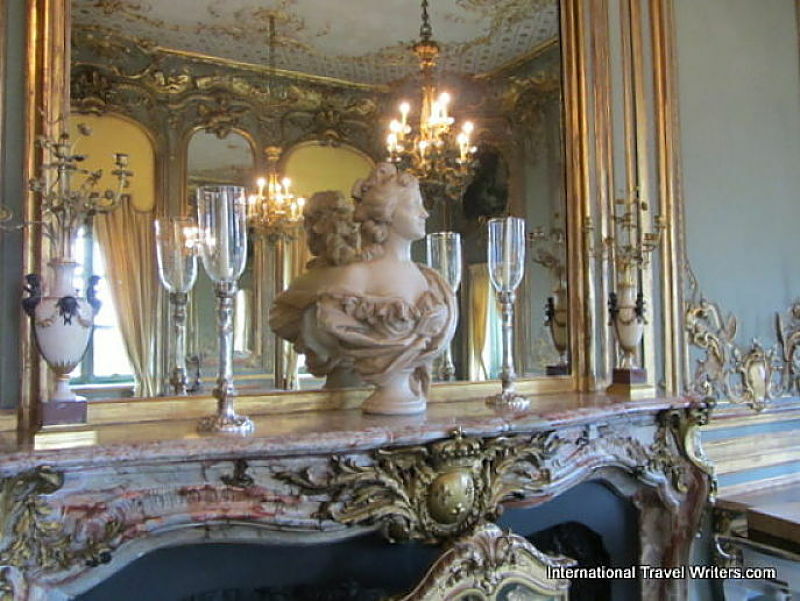 The mantle and other marble features are still in excellent condition and displayed with pride although some of these items were made in 1900 to match the room. 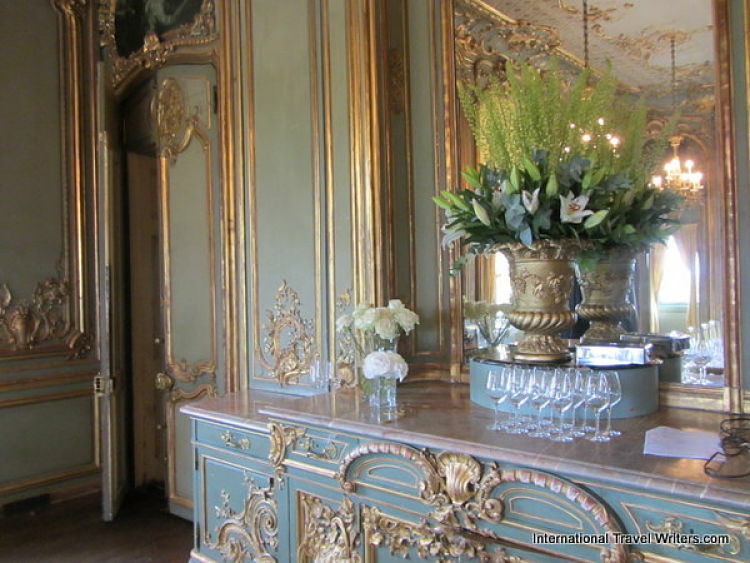 As you walk around the French Dining Room you see numerous examples of the Louis XV room with the turquoise and gilt background that has been transplanted to Cliveden. It retains all its beauty and legendary glory. Cliveden also became the setting for Astor's extensive collections of sculpture, tapestries and furniture. They line the halls and surround the perimeter of the main lobby area. 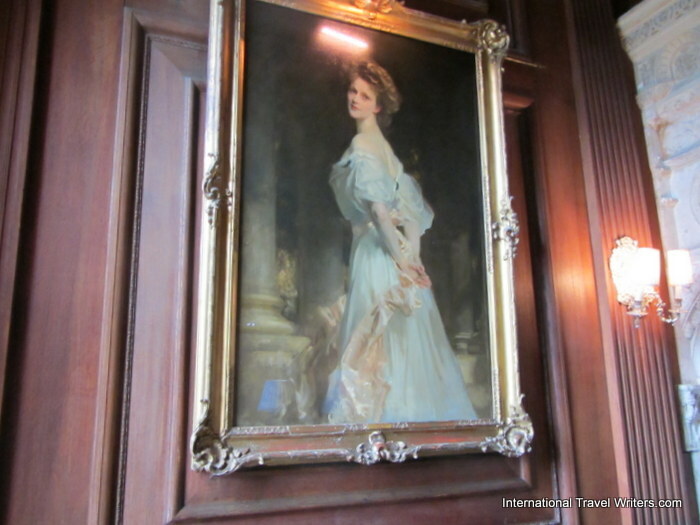 The splendor of Cliveden was soon matched with the social sparkle and wit of the beautiful and captivating Nancy Astor when it was gifted by William Astor to his son Waldorf upon their marriage. Astor also gave Nancy a magnificent tiara containing the famous 55 carat Sancy diamond which is now kept in the Louvre. 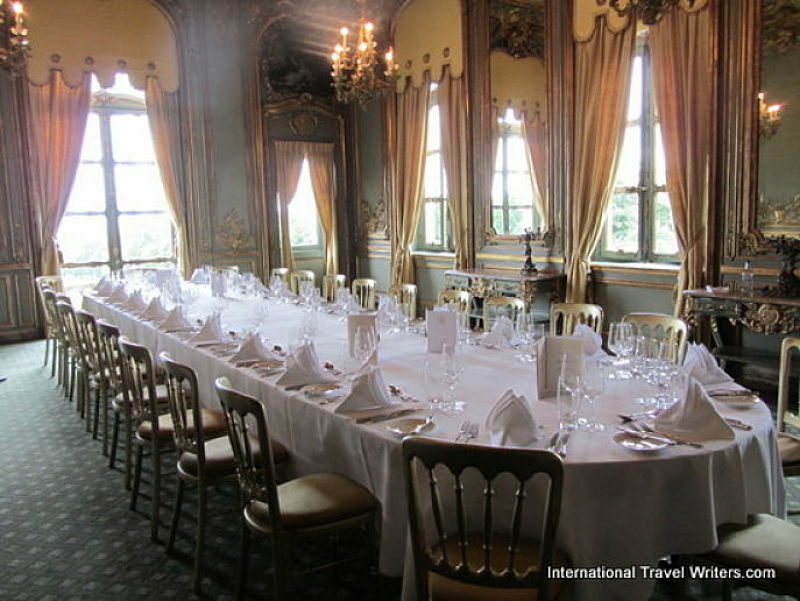 Lavish entertaining was to resume at Cliveden. From the time Nancy entered the House there were guests of great renown invited to visit. The Prince of Wales (the future King George V) and Princess Marie of Romania were a couple of the earliest. However, it was after the First world War that Cliveden really became the center of social and political influence. Nancy decided to enter Parliament and became the first ever woman MP (Member of Parliament) at Westminster in 1919. There are walls of photographs to document the visitors to this grand house. 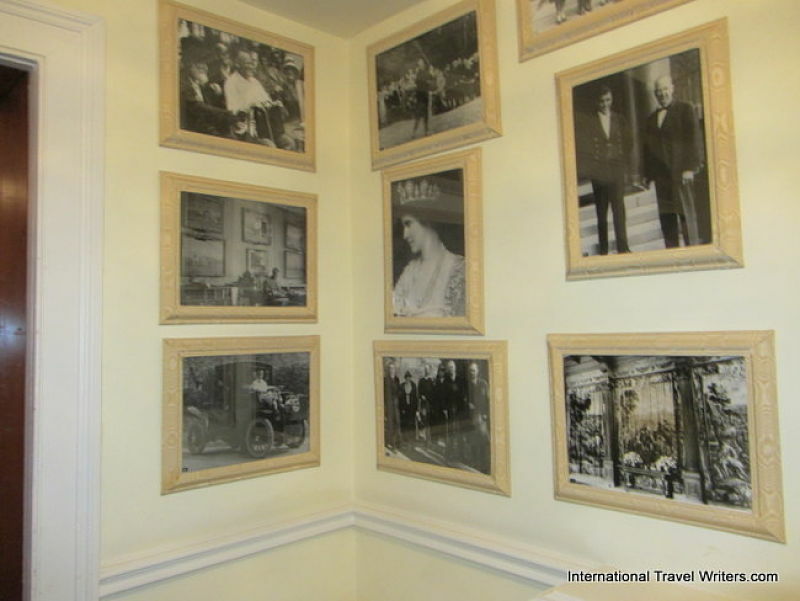 Even the wall corners on the lower floor are covered with numerous photos of the 'Lady Astor years'. Other walls have paintings lining the them. During the Second World War, the cost of the upkeep of the estate prompted Waldorf Astor to give the entire property to the National Trust (along with a bequest equivalent in today's dollars of $8 million) with the proviso that the Astors could remain living there as long as they wanted. Waldorf passed in 1952, Nancy in 1964, and Bill the eldest son in 1966...at this point it reverted to the National Trust. The National Trust then granted a 100 year lease to a company that years later become insolvent so it was recently acquired by Richard and Ian Livingstone, owners of London & Regional Properties in Feb. 2012. However, while it was still an Astor residence, it was mired in the scandal of the decade called the "Profumo affair" in July, 1961. Bill Astor had guests attending that included John Profumo, British Secretary of State for War, as well as Lord Mountbatten of Burma and the president of Pakistan. At the same time he had a friend, Stephen Ward staying at Spring Cottage on the estate with his guests including Christine Keeler, a 19 year old girl, and Captain Ivanov...a Soviet naval attache who was also a spy. 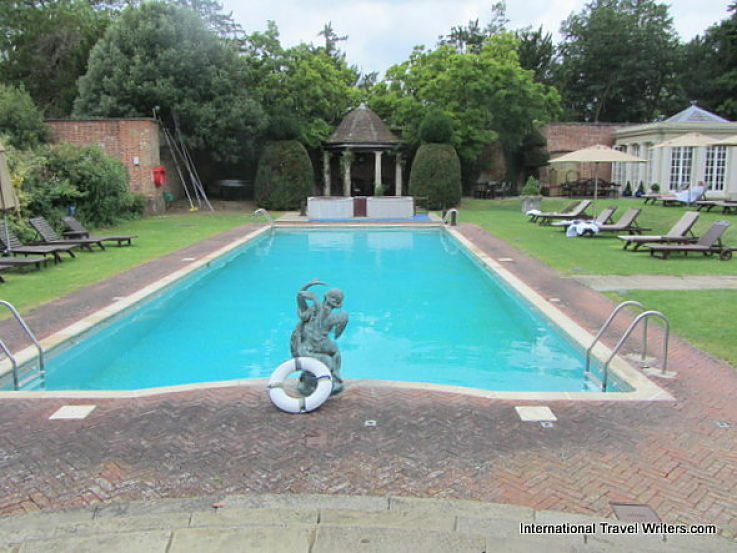 Ivanov and Keeler were mosily enjoying the Astors' outdoor swimming pool which still exists today. Hearing the commotion, Astor and his dinner guests went outside to see what was going on and Profumo encountered Keeler...sparking an extra-marital affair that went on for months. Moral questions aside, national security was the issue when it was discovered that Keeler was sleeping with Ivanov while seeing Profumo at the same time. She then sold her story to the press. Profumo lied to the House of Commons in 1963 denying any relationship with Keeler and Stephen Ward was made a scapegoat. He committed suicide during the court case. It ended Profumo's career and forever associated Cliveden with the infamous scandal. I was touched by the largesse of the Astors in both World Wars. Perhaps being Canadian affected me deeper because part of the grounds were offered to the Canadian Red Cross for a hospital during the World War 1. 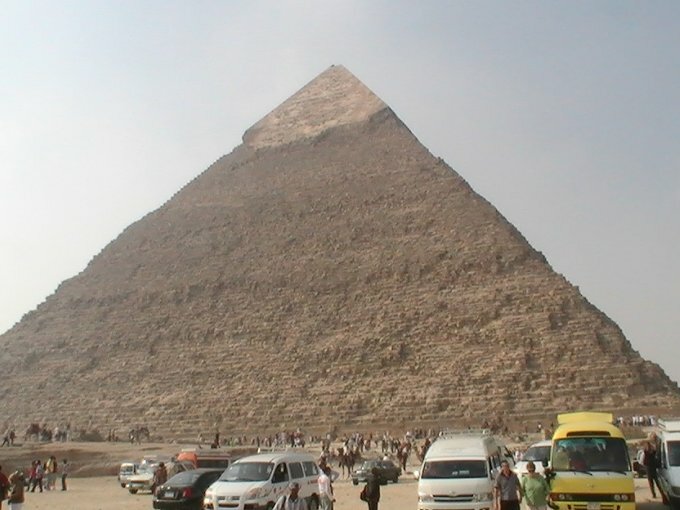 Although it was dismantled at the end of the war, it was again offered in World War 2 and this time it wasn't dismantled after the war. The Canadian Red Cross Memorial Hospital then became a nursing school, a maternity unit and had other functions until it closed in the early 1980's. 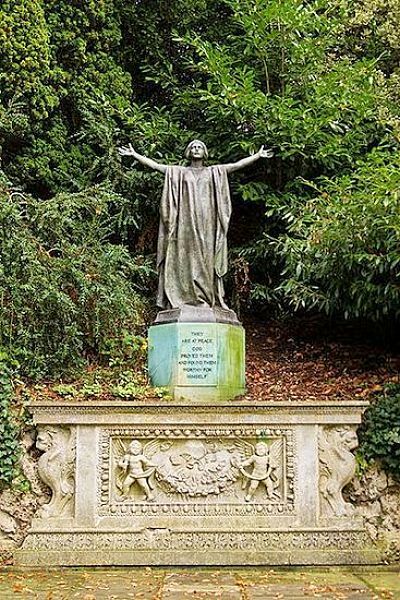 There is a Cliveden War Cemetery and the engraving on the monument says, "They are at Peace. God proved them and found them worthy for himself". 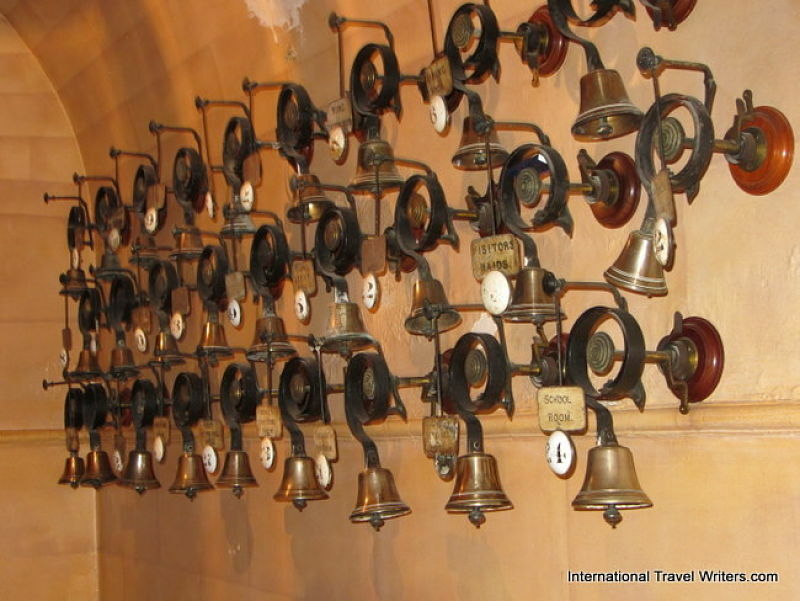 There were several things that captured my imagination while touring the property such as the quaint bell system that alerted staff that service was needed in one of the suites. 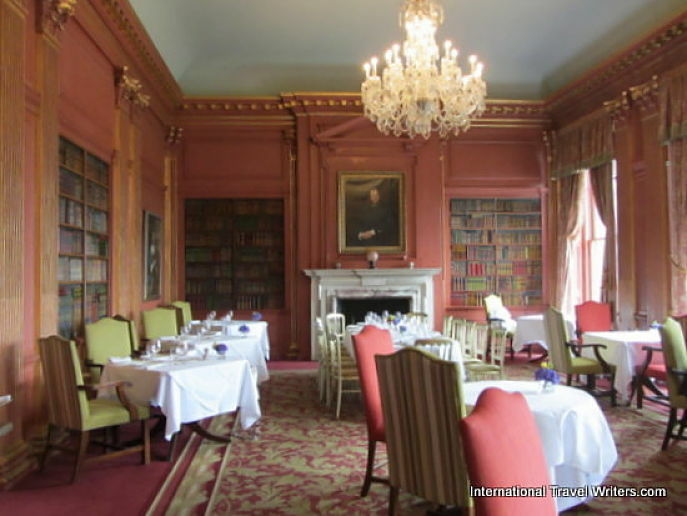 They have a first class dining room where guests and club members can enjoy both the outside views of the gardens as well as the warm atmosphere of the wood paneling. Original oil paintings adorn the walls and the book shelves are stocked with leather-bound volumes of the classics. 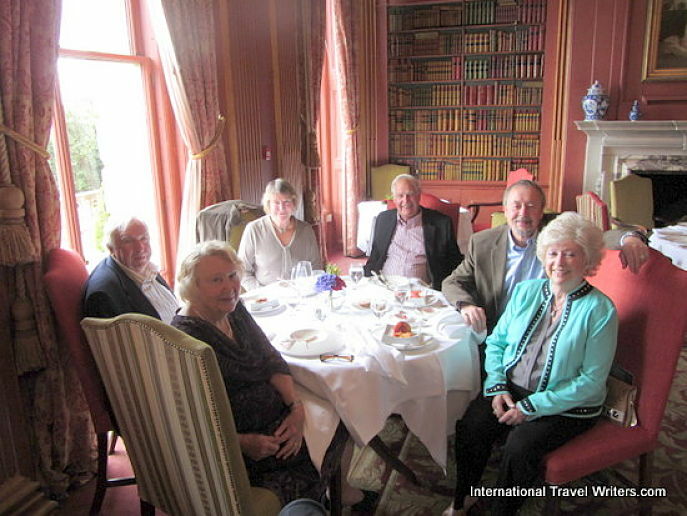 We enjoyed being the guests of Cliveden Club members Tony and Sheila (family members of our friends Jim and Yvonne) for lunch. The service and food were superb and who could not marvel at the magnificent views of the gardens visible from the window. This was definitely a high point of our day. 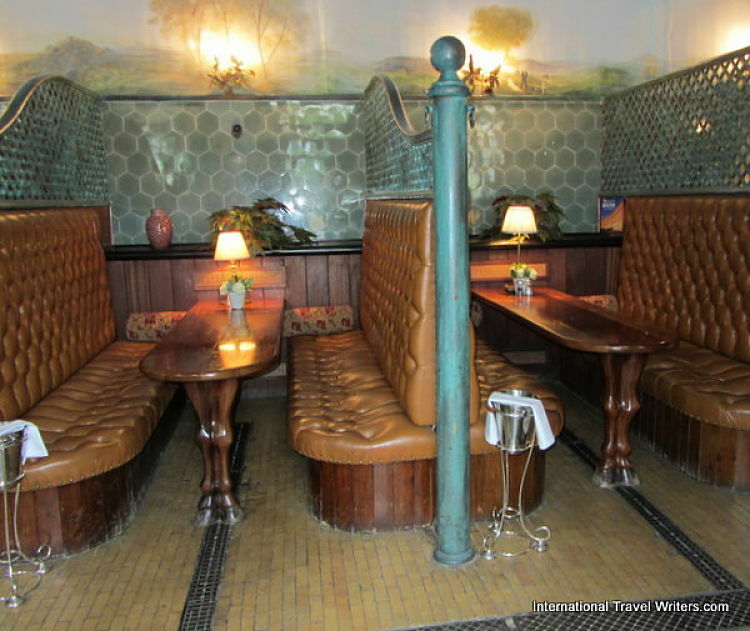 The former stables that are concealed behind a high wall have been converted into bar booths in a rather unique way. Plus, there are tables in a covered gazebo outside for those that want to enjoy the outdoors while they have a beverage (which we did). The outdoor pool is visible from the gazebo. 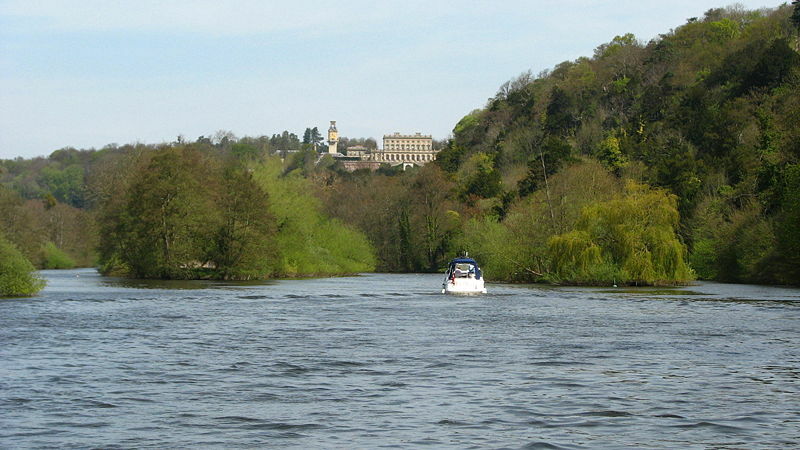 Cliveden, a three-storied Victorian mansion with a tall brick terrace that is only visible from the south, is set 130 ft. above the River Thames and the grounds slope down to the river. 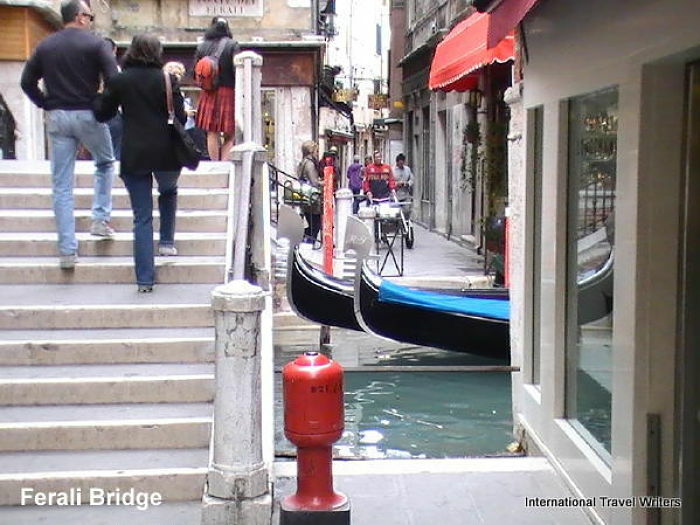 You can walk along this elevated area and view the magnificent and well-manicured gardens. The roof of the mansion was designed to be walked on (in the mid 80’s it had a lead roof installed) so you can gaze above the tree line and overlook sections of Buckinghamshire and even Windsor Castle to the south. 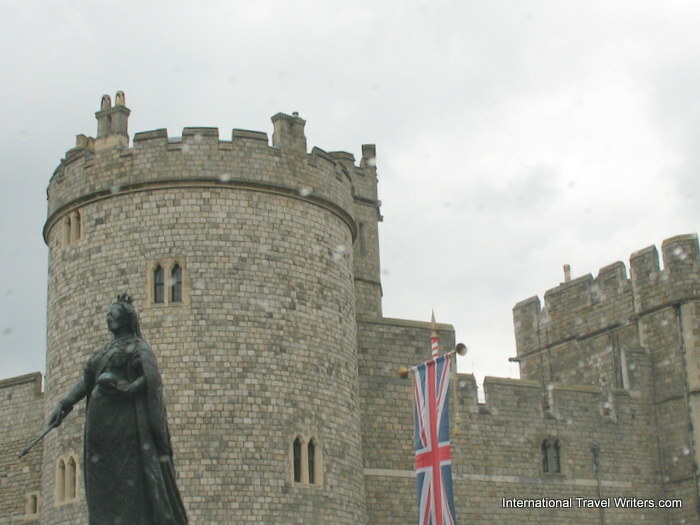 The close proximity might account for the many visits by Queen Victoria. The 5 star hotel has approx. 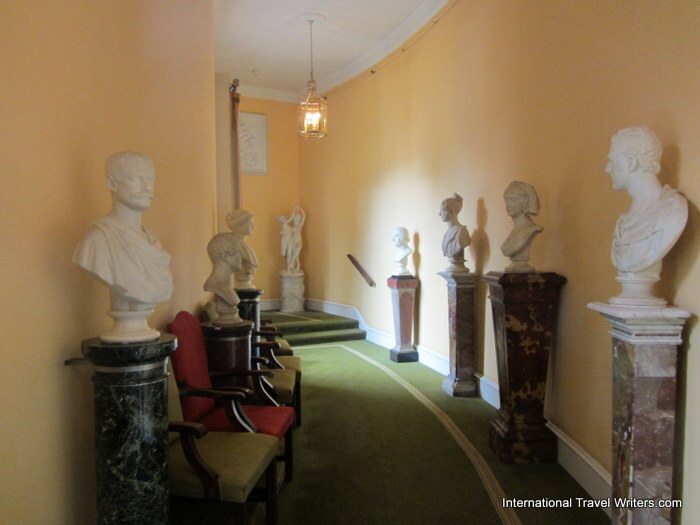 40 rooms which are named for dignitaries such as Churchill and Gladstone. The motto of the hotel is: "Nothing ordinary ever happened here, nor could it." When you see this Welcome Sign...you are in the right place. Like rare and fine wine...Cliveden has aged well.